Looking at the economy and fuel costs. With the latest fuel prices update we can see a small downward trend, which reflects the slowing economies. This month carries good news on fuel prices – they’re dropping! Although the drop is being pushed by a price war between the supermarkets more than the drop in the barrel price. This does make the price drops a lot more variable and this is reflected in the latest figures having the highest regional variation since I’ve started doing the measurements. It is also worth pointing out, that the drop so far has only taken fuel prices back by a couple months rather than to last year’s price plus annual inflation. Source figures courtesy of the AA. The critical values are that diesel has gone up 9.1% from last month and unleaded has increased by 6.3% since last month. Diesel is now averaging 13p per litre more expensive than unleaded. Treasury spokesman said the government understood business and families were “feeling the pressure from high fuel prices”. But they said the “immediate priority” was to encourage oil-producing countries to increase output, that a 2p-per-litre fuel duty increase had been put back from April to October and fuel duty was “still 11% below its 1999 level, in real terms”. The fact that the prices are 11% less in real terms, is misses the most crucial the point, which is the rate of change that is the problem, and that if fuel prices are to rapidly correct based on that real terms figures is going to really hit inflation. The Telegraph a running a campaign with a petition to get the 2p price rise scheduled for October on fuels stopped, and to take actions to slow the rate that fuel prices are increasing. As you’ll have seen by my previous posts fuel costs are increasing at whole percentage points per month (rather than per year) at the moment. 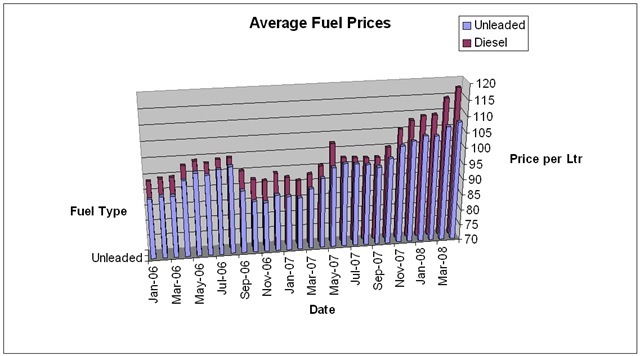 PetrolPrices.com have a range of figures reporting fuel prices as high as £1.37 per litre in parts of the country. Although the principal to slowly increase taxation on fuel to help fund public transport and encourage green activity maybe fun, the current rate of change is starting to make a notable impact on inflation, sufficiently so that it has the Mervyn King the head of the Bank of England has identified it as a factor on any number of occasions now. The campaign includes a petition here which you may wish to sign. The figures show that in the last month prices have jumped %1.3 on average for petrol and 3.5% on a month on month calculation this is on top of last month’s 2.9% and 5.4% respectively. If fuel prices are to climb in step with inflation (suggested to be 2.5% p.a.) we should be seeing monthly changes in the order of 0.2%. The question is, how long before this kind of fuel price acceleration is going to trigger inflation in the cost of necessary products such as food. With the government backing down on the 2p (~$0.04) per litre fuel increase in the last budget, and the feeling that fuel prices seem to be continuously and rapidly climbing, I decided I’d like to see a graph of the price changes. 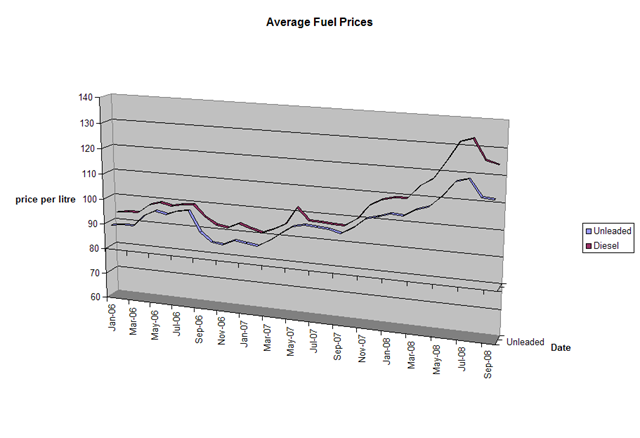 Thanks to the folks at PetrolPrices.com I’ve got a set of figures (from the AA) that have allowed me to build a graph. The figures are a lot more comprehensive than I have currently made use of. If I get time to build something richer then I’ll post that. If there is any interest then I’ll make the spreadsheet available.